Have you considered a skip bag for your next gardening or home improvement project? If you need the services of a skip, but don’t feel like you would have enough waste to fill a container that large, a skip bag could be the perfect, more affordable option for you! They are ideal for those small domestic DIY projects. Their convenient size means they will fit in your garden or driveway. We have all been there, having to take multiple trips to the tip and back, overfilling our cars and getting them filthy in the process. You can avoid all this mess with a big red skip bag. Waste disposal has never been so simple, just fill up your big red skip bag with waste and we will collect and dispose of it, doing all the hard work for you. What can you fill your skip bag with? If you have any waste that is not covered in the above list and want to confirm if we can collect it, give us a call on 0115 8246321. Is there any waste that can’t be collected? Place your bag in the correct position before you start to fill it up. You’ll quickly find out how difficult it is to move once it is filled with heavy waste! Keep pulling up the sides of the bag as you go, it will create more space! 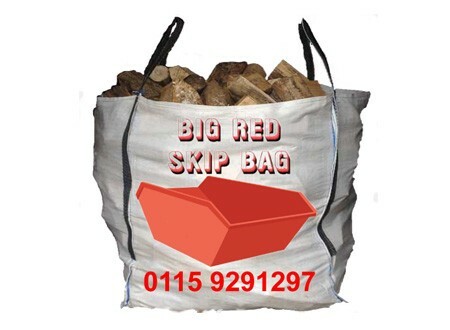 So now you know why and how to use one, order a big red skip bag today! A friendly member of our team will drop it off and collect it at your convenience. What is more, you will be doing your bit for the environment because we process all the waste we collect and aim to recycle everything we possibly can. Give us a call today to speak to an operator, or click here to order online!